We are open everyday from 12noon to 11pm. Last order is at 1030pm. FatPapas is a restaurant that provides halal gourmet burgers to everyone out there. Along with those delicious burgers are short ribs, shakes and more. This is a venture by FatBoy’s and Sheikh Haikel. Good food at affordable prices!!! i had to reserve for 18 pax for a birthday and they were sooo accommodating to us. their service and food was tip top too - staffs were friendly & food came really quickly too! Amazing food and will always come back for great burgers! The air con is not cold. Warm on the second floor. It can be quite noisy, considering it’s enclosed area. However, the food is brilliant portion. My fiancé and I ordered just 2 dishes and we were overwhelmed by the portion. The quality of food is fantastic. I would also like to add that their service is just top notch, everyone is friendly, helpful and ready to serve any customer. Thank you Fatpapas! The food was really worth the money and one meal can actually be shared by 2 people! The portion is huge and worth for money. Food is awesome. The food was great! The service given by the staffs (the two girls were very helpful and the food runner brought all of our food together) that served us was really good. Asyraf was kind to accomodate to our booking and is spectacular in his service. He was able to describe in a way that made me want to try the food. His recommendation for bleu cheese burger and soup of the day was great. Im really sorry for being demanding but I really greatly appreciate for accomodating to us. 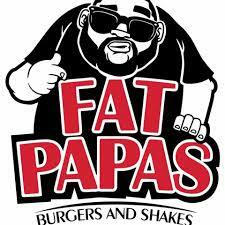 It is my first experience in Fat Papas and it really didnt disappoint me. Thank you for the wonderful experience today. I wished the cake came abit sooner as my friend wanted to almost leave but phew thank goodness you guys came in time. The french onion could use a few more garnishes, its abit underwhelming as french onion soup should like have cheese and bread topped. Nevertheless, it was a good soup. Atmosphere is abit too noisy but its a friday so it is expected. I know this is a lengthy read but keep up the good work!!! Staffs were friendly and pleasant. We all as a family felt comfortable and had a good time. We will definitely come back again! Thank you fatpapas! The food was great, portion was big and the staffs were really nice too! Friendly and comfortable. Generous portion of good food too! Food Portions were overwhelming.. Taste wise are awersome too.. Staffs were very Friendly, Helpful & Diligent..
Best service and food! Was honestly surprised. Great job team! Awesome customer service. Staffs were friendly too. Will surely come to drop by again. Plus its my 4th time having fatpapas at Bali Lane.  Big fan of you guys.